Gerard Hendrik Hofstede (born 3 October 1928, Haarlem) is an influential Dutch writer on the interactions between national cultures and organizational cultures, and is an author of several books including Culture’s Consequences and Cultures and Organizations, Software of the Mind, co-authored by his son Gert Jan Hofstede. Hofstede’s study demonstrated that there are national and regional cultural groupings that affect the behaviour of societies and organizations, and that are very persistent across time. This dimension measures how much the less powerful members of institutions and organizations expect and accept that power is distributed unequally. In cultures with low power distance (e.g. Austria, Australia, Denmark, New Zealand), people expect and accept power relations that are more consultative or democratic. People relate to one another more as equals regardless of formal positions. Subordinates are more comfortable with and demand the right to contribute to and critique the decisions of those in power. In cultures with high power distance (e.g. Malaysia), the less powerful accept power relations that are autocratic or paternalistic. Subordinates acknowledge the power of others based on their formal, hierarchical positions. Thus, Low vs. High Power Distance does not measure or attempt to measure a culture’s objective, “real” power distribution, but rather the way people perceive power differences. This dimension measures how much members of the culture define themselves apart from their group memberships. In individualist cultures, people are expected to develop and display their individual personalities and to choose their own affiliations. In collectivist cultures, people are defined and act mostly as a member of a long-term group, such as the family, a religious group, an age cohort, a town, or a profession, among others. This dimension measures the value placed on traditionally male or female values (as understood in most Western cultures). In so-called ‘masculine’ cultures, people value competitiveness, assertiveness, ambition, and the accumulation of wealth and material possessions. In so-called ‘feminine’ cultures, people value relationships and quality of life. 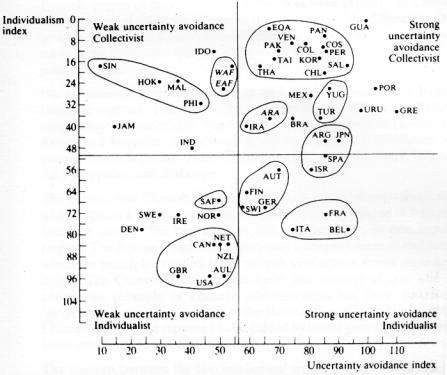 This dimension is often renamed by users of Hofstede’s work, e.g. to Quantity of Life vs. Quality of Life. Another reading of the same dimension holds that in ‘M’ cultures, the differences between gender roles are more dramatic and less fluid than in ‘F’ cultures. This dimension measures how much members of a society attempt to cope with anxiety by minimizing uncertainty. In cultures with high uncertainty avoidance, people prefer explicit rules (e.g. about religion and food) and formally structured activities, and employees tend to remain longer with their present employer. In cultures with low uncertainty avoidance, people prefer implicit or flexible rules or guidelines and informal activities. Employees tend to change employers more frequently. This dimension describes a society’s “time horizon,” or the importance attached to the future versus the past and present. In long term oriented societies, people value actions and attitudes that affect the future: persistence/perseverance, thrift, and shame. In short term oriented societies, people value actions and attitudes that are affected by the past or the present: normative statements, immediate stability, protecting one’s own face, respect for tradition, and reciprocation of greetings, favors, and gifts. These cultural differences describe averages or tendencies and not characteristics of individuals. A Japanese person for example can have a very low ‘uncertainty avoidance’ compared to a Filipino even though their ‘national’ cultures point strongly in a different direction. Consequently, a country’s scores should not be interpreted as deterministic.